Aside being a News Blogger, it may interest you to know that I am also a professional ICT Instructor. I make money teaching Individuals and organizations ICT related courses on freelance bases. Tonight, I want to share with you a knowledge I think might be useful for you as a computer user. You probably know what a ZIP File means but continue reading. of one or more files and/or folders, but is compressed into a single file for easy uploads or transfer via the internet. You cannot upload “ordinary” FOLDER as a mail except you convert or compress the folder to a Zip file. Let’s say You have 1000 files on a folder and you want to send it as a mail at once without attaching them separately which is time consuming. You have to compress the folder to a Zip File so it will become a single file attachment but with many files inside. The .zip extension at the end of a filename indicates that the file is compressed. This means that all the data in the original file is still there but smaller in size. That is, if the original folder is 100MB, the compressed zip file will be 80 or 90mb. Users often compress large files before sending them as e-mail attachments, because many e-mail programs cannot handle the larger files. The only problem with accessing that file is that you have to “unzip” it before you can use the data. 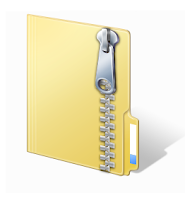 To Unzip it, simply double click on the Zip File, you will find the original folder inside and copy it. How To Zip a file or folder: Select the file or folder you want to compress. Right click and choose Send To Compressed (zipped) folder. Wait for it to finish compressing. That’s All. If you have any question or contribution about Zip files. You are Free to Do so.